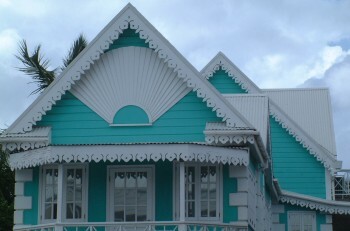 Visited: We visited both islands with the Angelos 4-6 March 2002, and again 8 April 2002 as we headed to Guadeloupe. 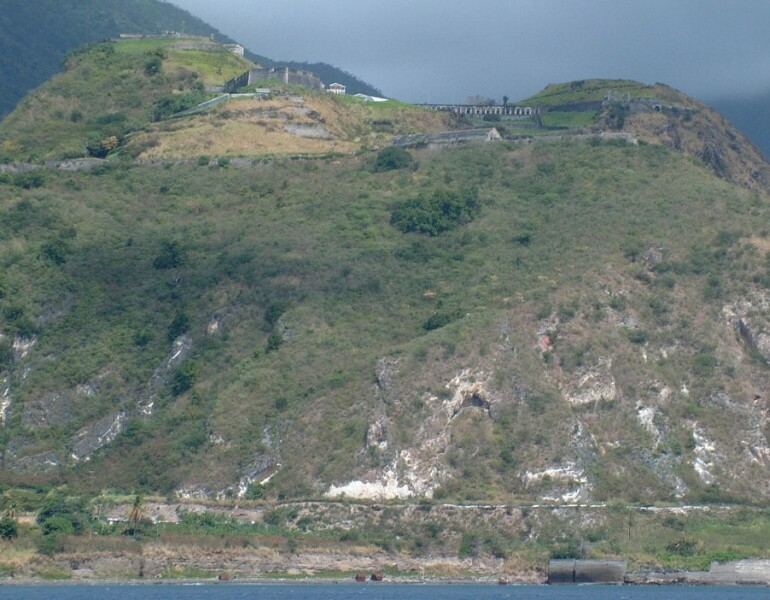 St. Kitts History: St. Kitts was settled by the British in 1623, the site of the first British colony in the West Indies. A year later, the French also settled the island, and they cooperated to slaughter the Caribs. The two nations then turned on each other, and the island changed hands until the 1783 Treaty of Paris gave the British solid control. 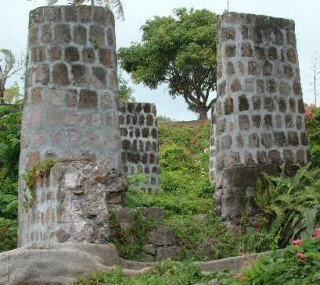 During this time, St. Kitts developed a flourishing sugarcane plantation-based industry, using African slaves. In 1967, England granted independence to the nation of St. Kitts, Nevis, and Anguilla. Although Anguilla worked its way back to the UK, the other two islands still qualify as one nation. The People's Action Movement (PAM) was predominant on St. Kitts when it gained independence, and its leader was in power for fifteen years. The PAM became increasingly unpopular during this time, with issues of corruption and drug smuggling. Meanwhile, the opposition Labour Party became stronger. In 1993, the Labour Party won the election, but the PAM allied with a minority party to prevent the Labour Party from taking power. Unrest and riots resulted, and, combined with corruption, guaranteed the downfall of the PAM. In 1995, the Labour Party overwhelmingly ousted the PAM, and, in 2000, took complete control of parliament. 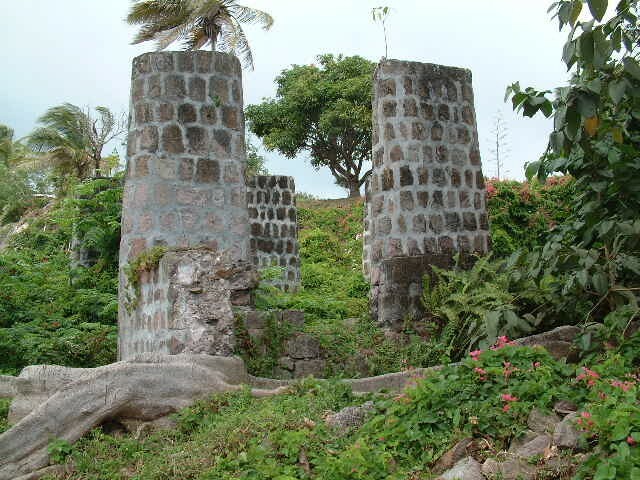 Nevis History: Nevis, settled in 1628 from British St. Kitts, built a similar sugarcane plantation industry. By the late 18th century, it had become a major retreat for the British wealthy. 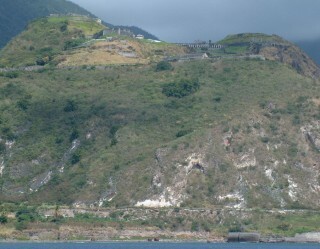 After it and St. Kitts became one nation, Nevis threatened to follow the course taken by Anguilla and returning to British rule. However, Nevis agreed to the union on the conditions that it had considerable internal autonomy and the option to secede if it chose to. While St. Kitts dealt with its internal affairs, a secessionist movement gained power on Nevis. It may not be long until it is its own country. 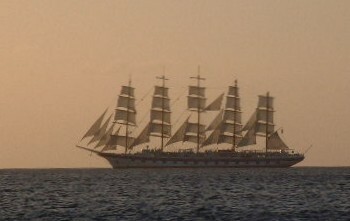 (Sue) We sailed from St. Barths past St. Kitts on March 4 2002, with Laurie, Jerry, and Claire (2 and a half) Angelo. We had great following seas, with smooth 10 to 12 foot swells in the 40-mile passage from St. Barths to the northern tip of St. Kitts. Expecting to have to motor down the leeward side of St. Kitts, we were pleased to be able to sail on the flat seas, just a mile off-shore. The island rises from the sea to low fields of sugar cane and a single round-the-island-road. Many old brick towers dot the landscape, remnants of old sugar plantations from the 18th and 19th centuries. 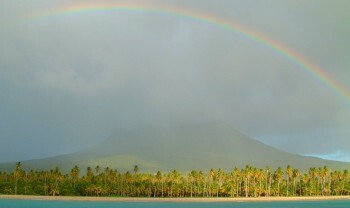 Afternoon squalls blew down from the volcano as we continued south, and across The Narrows to the island of Nevis. Although St. Kitts and Nevis comprise one independent country, the two islands have evolved independent attitudes towards tourism and boaters. We have found the people of Nevis more open and friendly than those in St. Kitts, so we sailed an extra 10 miles south to anchor off a long golden beach in north-western Nevis. A short (but exciting) dinghy ride took us to the town dock in Charlestown. 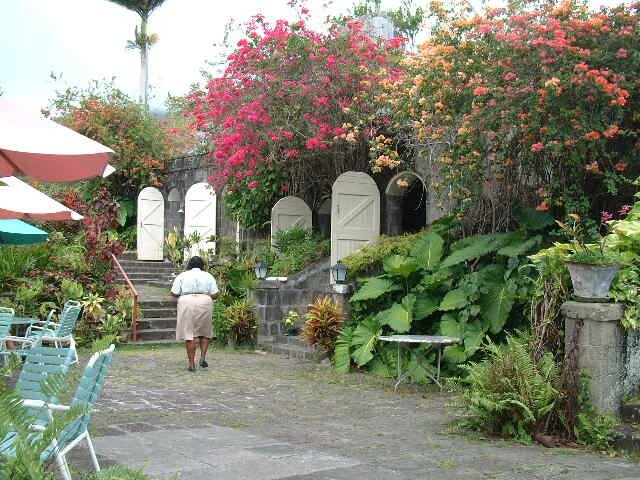 We walked through town (takes about 5 minutes) and then caught a local bus to an old plantation-turned-inn, high on the slopes of Nevis Peak. We strolled the luxuriant gardens colored with hibiscus, poinsettia, and ixora. Then we took a half-hour trail up the hillside, hoping to get a sense of the rainforest. 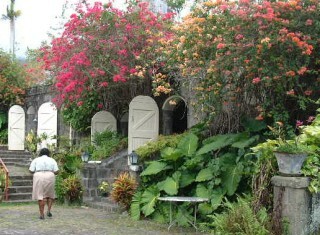 (Jon) Nevis is different enough from St. Kitts that it's sometimes hard to see why they made them one country. St. Kitts has a good agricultural economy, while Nevis seems content to remain a quiet backwater of an island, relying on a bit of tourism from old sugar plantations converted to inns to keep the economy going. Like Anguilla, we appreciate the unspoiled beauty of Nevis, and hope it can survive without having to step too heavily into the 21st century. 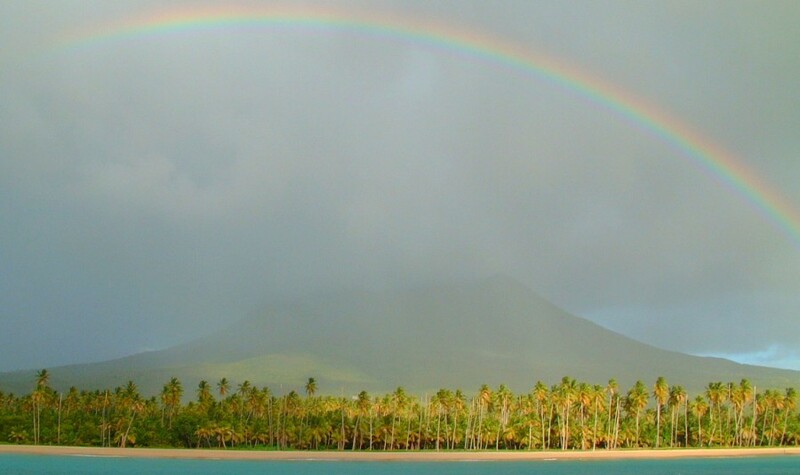 The anchorage off Pinney's beach, with a mile or more of unbroken sand, backed by coconut palms and the cloud shrouded peak of the volcano (see photo below) is one of my favorite memories of the Caribbean. We don't talk much here about St. Kitts, probably because our experiences there were not as much fun. When Sue and I were here in the 80's, the officials were so rude that we avoided St. Kitts when we could. This time, the officials weren't bad, but the anchorage off the main town was very polluted. 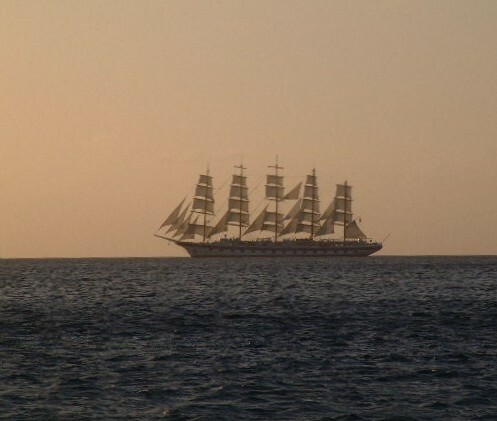 We did see a glorious 5-masted square-rigged ship set all her sail in the evening sunset while we were there, but in general we preferred the unspoilt beauty of Nevis. Besides, one of our favorite memories of Nevis from the 80s was driving around in a tiny Mini-Moke, searching for the perfect Rum Punch at the various plantation resorts with friends from Asante. We took a walk up into the rainforest on the mountain, and it was beautiful. Everything looked so lush and green, and yes, it did rain while we were there. I especially liked the palm trees, mainly traveler's palms, though there were some very tall royals, and tree ferns. I love rainforests, and that is probably my favorite place that we've been to so far. (Chris, age 15) Nevis is by far my favorite island so far. It is beautiful and rain forested, two things that I think the other islands were missing. The beaches are beautiful, the people are friendly, and the landscape is glorious. The day we went up to the old plantation I saw a monkey scamper across a field and up a tree. The forest has vines, flowers, towering trees, and frequent, refreshing rain. I feel we didn't spend enough time in either island, and would love to go back.